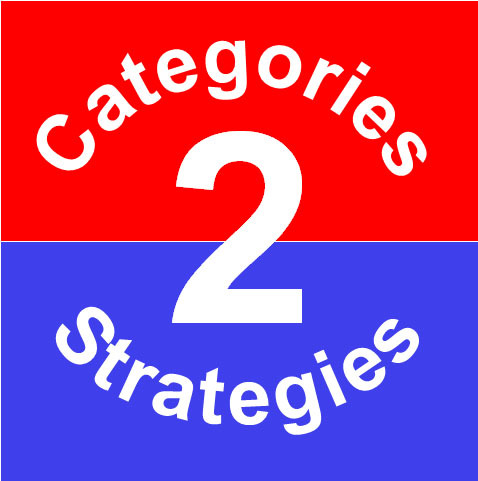 There are two types of categories and two types of strategies. All categories are not alike. Unless you know what type of category you are dealing with, you may be making a strategic error. Type No.1 is frequently-bought products which usually have a clear-cut market leader and a strong second-place brand. Type No.2 is infrequently-bought products which usually have no clear-cut market leader. Cola . . . . . . . . . . Coca-Cola and Pepsi-Cola. Energy drinks . . . Red Bull and Monster. Pizza . . . . . . . . . . Pizza Hut and Domino’s. Coffee shops . . . . Dunkin’ Donuts and Starbucks. Toothpaste . . . . . . Crest and Colgate. Smartphones . . . . The iPhone and Samsung. Batteries . . . . . . . Duracell and Energizer. Parcel delivery . . UPS and FedEx. Political parties . . Republican and Democratic. In a duopoly, there is almost no room for a No.3 brand. What is the market share of Royal Crown cola? The brand is lucky if it has more than a one or two percent share. Everybody knows Red Bull and Monster. But what’s the name of the No.3 brand of energy drink? Everybody knows Crest and Colgate, but what’s the name of the No.3 brand of toothpaste? Everybody knows Duracell and Energizer, but what’s the name of the No.3 appliance battery brand? The No.3 brands are Rockstar, Sensodyne and Rayovac. The latter brand is owned by Spectrum Brands, a company that went bankrupt in 2009. That’s not untypical for No.3 brands which are inherently weak. The dominance of the “top two” brands in a category can be demonstrated by the smartphone category. The iPhone and Samsung have only 36 percent of the global smartphone market, but by one estimate, the two brands account for 90 percent of the category’s profits. A strategy for frequently-bought brands. Naturally, a company wants its brands to establish leadership positions in every category they compete in. But that’s not always possible. Leadership is usually determined by the first brand in the mind. Coca in cola. Red Bull in energy drinks. Gatorade in sports drinks. The iPhone in smartphones. But what determines which brand winds up in second place. Often, but not always, the No.2 brand is the “opposite” of the leader. After the launch of Coca-Cola, hundreds of other cola brands flooded the market, including Pepsi-Cola. The difference? Coca-Cola was sold only in 6.5-oz. contour bottles and Pepsi was sold in 12-oz. bottles. Hence, the radio jingle. Pepsi-Cola hits the spot. Twelve full ounces, that’s a lot. Twice as much for a nickel too. Pepsi-Cola is the drink for you. And how did Starbucks compete with market leader Dunkin’ Donuts? By doubling the price of its coffee. Strong No.2 brands invariably achieve their positions by strategies that are the exact opposite of the leader’s strategy. If no brand is launched that does not take an “opposite” position in the category, then the leader brand will often achieve what amounts to a monopoly position. Gatorade, for example, outsells the me-too Powerade brand five to one. Take life insurance, which people buy perhaps once in their lifetimes. Which brand is the leader in life insurance? Northwestern Mutual with a market share of 8.5 percent. Does that surprise you? It should because few people perceive Northwestern Mutual as the leader in the category. As you can see, there are no strong No.2 brands in the life insurance category either. Obviously, a life insurance brand can’t be the opposite of the leader if no one knows who the leader is. Or what position it owns. A strategy for infrequently-bought products. What should a life insurance brand do? It should narrow its focus to one singular attribute. And then hammer that attribute in everything it does, including its name and its strategic position. Do you know what any of these life insurance brands stand for? Probably not, because they don’t stand for much. Take automobiles which people also buy infrequently. Which brand is the leader in automobiles? Ford with a market share of 14.2 percent. And here are the next ten brands in the category, along with their market shares in the year 2016: Toyota (12.0%), Chevrolet (12.0%), Honda (8.4%), Nissan (8.1%), Jeep (5.3%), Hyundai (4.4%), Kia (3.7%), Subaru (3.5%), GMC (3.1%) and Ram (3.1%). Obviously, an automobile brand can’t be the opposite of the leader if no one knows who the leader is. Or what position it owns. Go back to the year 2000 and look at which automobile brands weren’t on the list that year, but are on the 2016 list. Those are the brands that have made the most progress. There are three: Hyundai, Kia and Subaru. And they all made the list because they focused on something very specific. But Hyundai and Kia entered the market at the low end, avoiding the competition with mainstream brands like Ford, Toyota and Chevrolet. Subaru hammered its four-wheel-drive vehicles, the only brand focused exclusively on four-wheel drive. Confidence in motion is Subaru’s theme, a relatively weak expression of a powerful idea. Now you might be thinking, What possible difference does it make? We are customer oriented, not category oriented. That’s a mistake. You win or lose in today’s marketplace by being competitor oriented, not customer oriented. A second mistake is to ignore the category you compete in. The category should also dictate your strategy.